Universal Ad ID is visible in MediaInfo, with the possibility to automaticaly extract it in XML with the command line. Embedding and editing of Universal Ad ID metadata in MOV (Apple QuickTime) or MP4 (ISO/IEC 14496-14 a.k.a. MPEG-4 Part 14) files. Embedding and editing of PAR (Pixel Aspect Ratio), command line only. 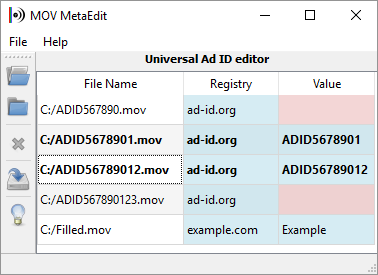 After having drag and dropped (or from the "File" menu) some files, the Universal Ad ID view displays information (Universal Ad ID registry and Universal Ad ID value) about each file in a table. Then it is possible to edit Universal Ad ID registry and Universal Ad ID value, respecting standard Ad-ID format in case of Ad-ID registry, and save this metadata. A command line version is also available. MediaInfo can extract such metadata. Currently available only from the command line version, developped for an anonymous sponsor who did not need of a GUI. It is possible to embed or edit "pasp" atom as well as the width scale in the "tkhd" atom. It is Open-Source software which means that end users and developers have freedom to study, to improve and to redistribute the program (MIT license for the code developed by us).